Today’s blog article has kindly been provided by Chris Burnett, an Associate Patent Attorney at A. 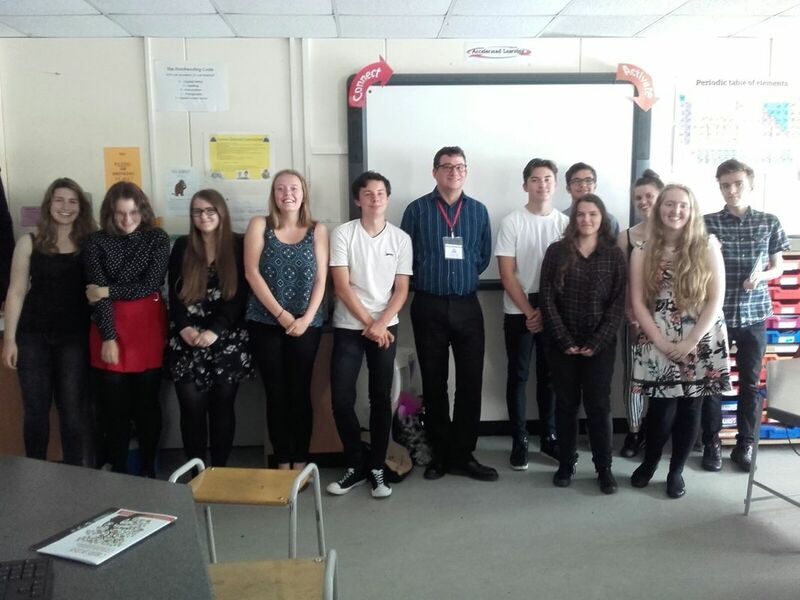 A. Thornton and is about the talk he recently gave to sixth formers at the Hylands School in Chelmsford, Essex about the careers available in IP. Chris is on the IP Inclusive taskforce and is working on the project to raise awareness of the IP professions among schools, universities and careers advisors. A. A. Thornton are one of our Charter signatories. Chris writes: The last time I stepped into a secondary school was when I was a pupil nearly 20 years ago. I instantly stepped back in time walking through the main door, and familiar sights and sounds came flooding back. Some things had of course changed – people were now holding the door open for me and calling me “sir”, blackboards were now projector screens and the computers weren’t BBC Micros… but you get the general idea. I have been involved with IP Inclusive for a while now, and I am part of the Careers In Ideas team, who are trying to increase diversity by spreading the word about IP-based careers to those who have never heard of them. Like many others in the various IP professions I only found out about my present job through a family member who happened to know one. Clearly, in terms of increasing diversity this is no way to continue. In one strand of my work for IP Inclusive we are encouraging people to visit schools, universities and careers fairs to talk about what they do. This was me practicing what I preached. The Careers In Ideas initiative is about inspiring people to take up a career in IP, and since many of these careers require a STEM degree, what better place to start than sixth formers taking science A-levels who are looking to apply to university? I was invited to talk at Hylands School by my next-door neighbour, who is a science teacher there. Hylands is a medium-sized secondary comprehensive academy in Chelmsford with just over 700 pupils and several farm animals. Many of the students I spoke to had already decided to go to university to study science degrees, so I merely had to inspire them with tales of my daily grind. ​I have to admit I was nervous. The sort of nerves you get when you first have to lead at oral proceedings in Munich. I’d practised my spiel at home earlier, and it just wasn’t working. My wife wondered if I was on the phone to someone who kept interrupting. I shouldn’t have worried of course – if I can’t talk about myself for half an hour, then what can I do? Armed with my presentation, copies of the excellent Careers In Ideas careers guide, and some A.A. Thornton branded material, I got into my flow. The students were great – they were attentive, and were obviously grateful to have someone show an interest and come in to talk to them. They asked some wonderful questions, such as which three scientists, alive or dead, would I like to have dinner with? Which invention that I’d seen would I most like to steal? (I re-formulated the problem as a “which invention would I most like to buy?) The teachers present were more impressed than the students when I excitedly told them a bin you could actually get the bag out of without it ripping. In addition to talking about what IP (and patents in particular) actually is, I also talked about what I actually do at work, and how you qualify to become a patent attorney. I also talked about the other various jobs in IP that are available. I urge anyone reading this to consider doing a talk for a school/university as well. Maybe to those who have not yet chosen their A-level subjects. If you want to talk at your own school, then also aim to talk to a different school, maybe one that has a different demographic to your own school. Whilst I didn’t go to Hylands, I went to a similar comprehensive also in Chelmsford. If this is something that you have already done, or wish to do, please get in touch to find out how you can share your experience or borrow some resources. The Careers In Ideas website has some materials that can be used to help you. Thank you Chris for this great report, and for raising awareness of the IP professions and of Careers in Ideas. If you are involved in outreach, we’d like to hear from you! Similarly, if would like to get involved in raising awareness and want to know more about Careers in Ideas, please get in touch with Chris or Parminder.